Blogs eventaa- Has Corruption Muddled the Event Industry? Home Blogs & Article Hindi Has Corruption Muddled the Event Industry? Has Corruption Muddled the Event Industry? Corruption; in simple terms, is unethical conduct by a person or authority. Anyone who misuses the power entrusted to him/her for personal gains is guilty of resorting to corrupt practices. It is a global issue, discussed and debated about at multiple forums in various countries across the globe. Every industry in the economy has fallen prey to corruption including the event industry. Event industry stands out as a well-equipped industry that generates employment for more than 5 lakh people; directly and indirectly. Both organized and unorganized Event and Wedding industry are estimated to be approx. 4 lakh crores industry. The core objective of eventaa.com is to raise the voice of the event industry, list out various issues and bring desired changes in the ecosystem to bring in ease of doing business in the event industry with best business practices. Corruption is one of the critical issues which we are trying to address here. Planning an event is a mammoth task, there are various licenses and permissions that the event managers, planners, and organizers need, to organize their events. This is the most painful area of any event. To comply and procure licenses with all the authorities itself is a mammoth task, be it small or big scale event. Time is a limited resource for an event company, and compliances vary from state to state, city to city, they are left with no option but to surrender to agents/coordinators. This is where the event companies fall prey to corruption. Whether one desires or not, one has no choice but to shell out official and unofficial payment. This fact cannot be denied by any event company of India. Heights of things are that corruption does not leave an event company even if they are doing events for government itself! Over and above corruption in cash, another big issue is the challenge from the police department and other departments. For good shows, they not only take away a big chunk of tickets but also push people to enter in an unauthorized manner. Any denial or dissatisfaction created by them could be dangerous for the show. The reason is the unlimited authority and non-accountability. In front of the authorities, one is made to feel so small that even a multi-crore event organizer is made to feel like a clerk in front of them. 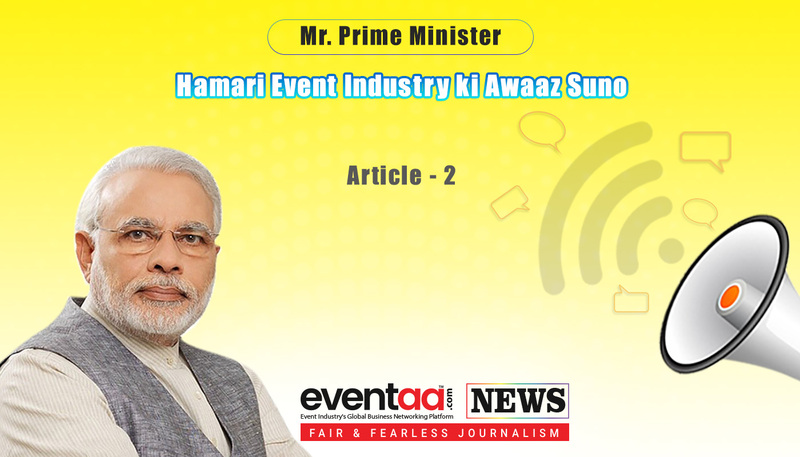 On behalf of the entire event industry, eventaa.com requests the Prime Minister and the Information & Broadcast Ministry to look into this serious concern and frame clear cut and appropriate policies as a solution to these issues. Procedures which can reduce corruption in the event industry and make it easier for the event planners and organizers to organize their event without any problems successfully. If ease of organizing an event is ensured by the government by a single window process, not only there will be growth in the event industry, but even the government exchequer will be greatly benefited. Have you ever faced the issue related to corruption in any of your events? Share your experience in the comments below. Also, your views and suggestions regarding this article are most welcome.